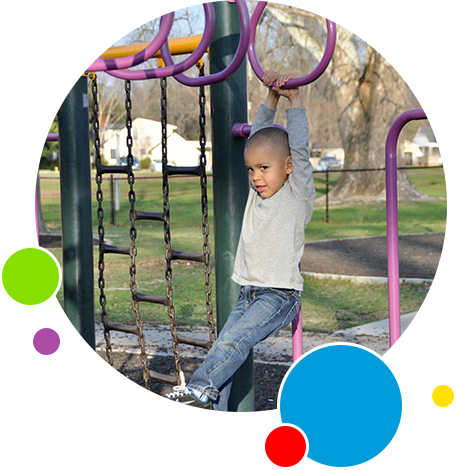 Process of Creating the Leaps and Bounds Playground | Right To Play, Inc. Thinking about designing your own universal accessible playground? What follows is a brief overview of the process we took to build the Leaps and Bounds Playground. When we began, there was an organization called Boundless Playgrounds® that aided individuals who wanted to build a universally accessible playground. Unfortunately, this organization no longer exists. You are more than welcome to contact our organization, if you have additional questions. Identified six people who felt the same way I did about the need for a playground where children of all abilities could play together. The seven of us became the Board of Directors. We decided that we would remain an all-volunteer organization and not hire any staff. Found an attorney who donated his time and ability to help write our by-laws and become incorporated. priorities. This meeting included teachers of children with special needs and without, commercial and landscape architects, occupational and physical therapists, etc. We were fortunate to be able to fly Jean Schappet, Director of Design for Boundless Playgrounds® to facilitate this meeting. She compiled the results into a Priority Matrix. We then held a Children’s Dreaming and Design Party. Approximately 50 children of various abilities voiced their opinions on what they would like to have in their unique playground. Art supplies were provided as design materials. Adult volunteers took notes on the children’s designs and comments. We submitted the results of this Party, including the children’s drawings and anywritten description children wrote as well as any information our facilitators garnered from children that needed help getting their thoughts across, to Boundless Playgrounds®. Conceptual Design: Developed by Boundless Playgrounds® based on information compiled from the Priority Matrix and the Children’s Dreaming and Design Party. RTP continued to involve children in the design process. We held a community-wide contest for school age children to nominate a name for their future playground. The name, “Leaps and Bounds” was selected. The winner was announced at a party in the park where the future playground would be located. Vender Search and Selection. I, along with another board member, attended an international convention of playground equipment manufactures. We compared equipment and interviewed designers. Unfortunately, the company we selected later went bankrupt. By that time, we were well into our design process with them. We had chosen this manufacturer because they had a designer that thought outside the box. He had taken the conceptual design Boundless Playgrounds® had developed along with additional elements we wanted to include and came up with a design we really liked. Fortunately for us, GameTime, our second choice, hired this designer. He was able to recreate much of what he had previously designed for us and was able to convince GameTime to find a way to manufacture what we wanted. The design had to be reviewed and approved by Boundless Playgrounds® as well as our local park authorities. We ran into several additional problems along the way. One of the hardest was the issue of liability. Our board did not want to be held liable for any injuries that might occur once the playground was completed and donated to the City. We began the process in 1999. It took a year for us to solve the insurance issue in our favor. Then the fundraising could start. Since I am a veterinarian and the others on the board also had real jobs, none of us had any training in the art of grant writing. One of my board members and I took classes on grant writing and tackled the job of applying for grants. After about a year, this board member moved to California and I continued this difficult job. I also talked to every service club, organizations, schools, churches and synagogues possible and asked for donations. It took a lot more money and years than we had ever expected to build this playground. We were faced with many issues that slowed our fundraising attempts. 9/11 hurt. We did not feel comfortable asking for donations when our country was in a state of shock and mourning. We had hoped to build the entire playground at one time, but because we had designed such an elaborate playground, it was impossible to raise such a large amount of money at one time. We were afraid people would start to doubt us. Finally, in January 2005, community volunteers came together and installed the 5 – 12 year olds’ play structure. Our contractors had already poured the concrete and had drilled all the holes needed for the posts. Having volunteers spend 4 days putting together and installing the equipment saved us an estimated $70,000 in labor costs. The special surfacing was professionally installed in February 2005. The water play area was added shortly after. Then in August 2005, Hurricane Katrina happened. With so many displaced people and pets, we stopped actively seeking donations. In 2007, we added a tire swing over solid poured-in-place surfacing, four strap swings over shredded rubber surfacing, two strap swings and two high-backed adaptive swings with harnesses over solid, poured-in-place surfacing. By 2010, we had completed the toddler area (crawl tubes, bucket swings, spring toy, slides and crawl tube) and the music/garden area (free standing outdoor musical instruments, two raised sensory garden beds and three wind sculptures). In 2012, we installed a GameTime Rock-n-Raft. In 2016, two accessible picnic tables and benches were installed. Many playground manufacturers now offer customized play systems that are ADA compliant. At the time we were designing our playground, most prefabricated structures used transfer steps instead of ramps. We did not like the idea of only incorporating transfer steps that forced a child to leave their wheelchair behind in order to access the elevated portions of the 5 – 12 year olds’ play structure. Plus, the parents of children with special needs we interviewed did not want their children to always get on and off at the same location. Our play structure offers two ramps. The entire 5 – 12 year olds’ playground structure is wide enough for adult wheelchairs. There is one elevated section wide enough for two wheelchairs to be side by side. Although shredded rubber is considered ADA compliant, we wanted solid surfacing in the areas we knew were most likely to be used by those in wheelchairs. This greatly added to our expense. Currently, I believe the city values the playground as being worth $1,000,000 – 1,500,000. In 2017, it is a lot easier to build more accessible playgrounds than in the past. Start by requesting catalogs from all the major playground manufacturers. One may have the exact components you are looking for. Also, The National Center for Boundless Playgrounds® did write a book in 2003 by Jean Schappet, Antonio Malkusak and Larry D. Bruya called High Expectations: Playgrounds for Children of All Abilities. I know it’s not current, but it does have sample designs of accessible play systems by different manufacturers. I hope that you will find some of this information helpful.